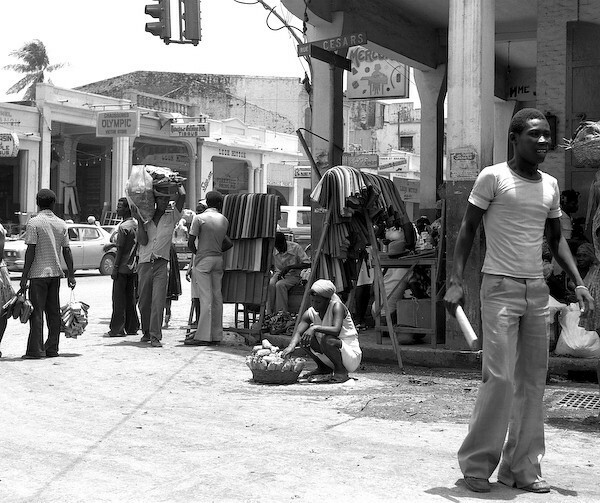 'Haitian Market Corner' was made in 1979 in Port au Prince, Haiti. I used a Mamiya 6X7cm camera and black and white film. The negative was scanned and the print was produced on AgX paper and processed. This photo was made in the fabric district of Port au Prince, but this busy corner has a broad range of activities, from people carrying their assorted wares hoping to be sold that day to people settled in the shade displaying their shoes, hats and fabrics. The woman in the front center is selling cooked food rolled up in paper.